The Army desires a Reconfigurable Virtual Collective Trainer (RVCT) to serve as a platform enabler of the Synthetic Training Environment that will allow units and soldiers to conduct realistic, multi echelon, collective training anywhere in the world. The Government will evaluate the prototype solutions submitted to this announcement with the intent of negotiating a prototype Other Transaction Agreement under the Training and Readiness Accelerator (TReX). 2.1 The Army’s future training capability is the Synthetic Training Environment (STE). The STE enables tough, iterative, dynamic, and realistic multi-echelon / combined arms maneuver, mission rehearsal, and mission command collective training in support of multi-domain operations. 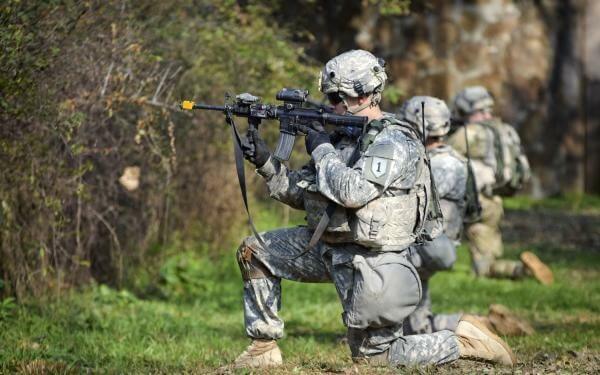 The STE will provide units the repetitions necessary to accelerate individual through unit skill and collective task proficiency resulting in achieving and sustaining training readiness. Separate, but interoperable, RVCT systems are required for both air and ground collective training. The RVCT Air will represent the Army’s fleet of rotary wing aircraft while the RVCT Ground/Solider will represent ground/amphibious track and wheeled vehicles. The RVCT must be able to portray the complexities of multi-domain operations without impacting positive training transfer. The STE Common Synthetic Environment (CSE) delivers software, application(s) and services that will enable the RVCT. 2.2 The CSE and RVCT collaborate to represent platforms in the Army inventory. The CSE focuses on virtual platform exterior representations and their environmental interactions. The RVCT focuses on virtual and physical platform interior representations (e.g., 3D Models) and behaviors. 2.5 This prototyping effort will be conducted as an agile development activity to evaluate the technical feasibility and military utility of vendor-developed RVCT solutions. 3.1 The RVCT Statement of Need, Attachment 1, contains a robust description of the technical objectives and desired prototype solution(s) for the RVCT. Vendors are encouraged to challenge any assumptions or restrictive requirements in their individual solutions and should articulate any major discrepancies between the Statement of Need and their technical solution. A full list of attachments and appendices is located at the end of this document. 3.2 Vendors interested in responding to this Request for Solutions must be members of the Training and Readiness Accelerator (TReX). 3.3 The cost of preparing and submitting a response is not considered an allowable direct charge to any Government contract or agreement. 3.4 An individual vendor may not submit more than one comprehensive response to this RFS as a Prime. Separately, vendors may submit a single, stand-alone Prime response in support of RVCT Air or a stand-alone combined response with both RVCT Ground and RVCT Soldier. Vendors who submit a comprehensive response are not required to submit a separate RVCT Air or RVCT Ground/Soldier response. A vendor may participate as a sub to multiple responses. 3.5 At award, the selected vendor will be encouraged to enter into Associate Vendor Agreements for any portion of the agreement requiring joint participation in the accomplishment of the Government’s requirement – likely to include the appropriate hardware interface and integration with the CSE. CSE integration will require technical data exchange, dialogue, and software/hardware integration of proposed solutions. It is expected that vendors may have to work directly with other vendors under Government integration oversight to help establish and extend the RVCT platform to meet identified gaps. 3.6 Non-compliance with the submission instructions provided herein may preclude the vendor from being considered for award. 4.1 The Government desires the RVCT to be built on a modular open system approach with an Intellectual Property (IP) model that allows it to evolve with future technologies and capabilities. This means that the Architecture and IP must support future competition and a collaborative explorative environment which facilitates participation of commercial innovators and Government entities partnering with the STE. 4.2 The following definitions apply to this section. Government has obtained Government purpose rights under this agreement for any commercial purpose during this five-year period. Upon expiration of the five- year or other negotiated period, the Government would receive unlimited rights in the technical data and computer software. 4.2.2. Unlimited rights means rights to use, modify, reproduce, perform, display, release, or disclose technical data in whole or in part, in any manner, and for any purpose whatsoever, and to have or authorize others to do so. (iii) The contractor or subcontractor asserting the restriction is notified of such reproduction, release, disclosure, or use. 4.2.4. Restricted rights applies only to noncommercial computer software and has the meaning included in Defense Federal Acquisition Regulation Supplement 252.227-7014(a)(15). 4.3.1 Government purpose rights to all development and deliverables of technical data, computer software, and computer software documentation funded under the transaction agreement, for at least a five-year period. 4.3.2 Proprietary (prime or sub-vendors) software coding or hardware development (to include vendor licensing requirements) shall not be included without prior Government approval. 4.4 Vendor responses should clearly describe the offered rights in technical data and computer software that will be delivered with your solutions. 4.4.1 The offered rights should be displayed in a manner that allows for ease of discussion in determining trade-offs and potential options for long-term sustainability of the deliverables of this effort. 4.4.2 If limited or restricted rights are being asserted within your response, detail the specific rationale for this assertion within the technical volume (and within the price volume include a table that prices Government Purpose Rights for any such limited or restricted item). 4.4.3 Any items previously developed with federal funding should clearly identify all components and the Government entity the items were delivered to. 4.4.4 If commercial software is proposed as part of the prototype solution, all applicable software licenses must be included with the response. Note that any software license term or condition inconsistent with federal law will be negotiated out of the license. 4.4.5 The United States Army has release authority on any publications related to this prototype project. 4.4.6 Vendors shall populate the “Data Rights Provided” line for each deliverable item contained in Attachment 4 and provide as part of the technical submission. 5.1 The Government may award separate Prototype Other Transaction Agreements for RVCT Air and RVCT Ground as a result of this Request for Solution; however, a single award encompassing the scope of both may be made if determined to be in the Government’s best interest. 5.2 All questions related to this RFS shall be submitted utilizing the Vendor Questions Form provided in Attachment 5. Questions must be submitted via email to initiatives@nstxl.org, with “STE-RVCT” used in the subject line. Questions must be submitted no later than 12:00 PM EDT on April 16, 2019. Questions received after the deadline may not be answered. Questions shall not include proprietary data as the Government reserves the right to post submitted questions and answers, as necessary (and appropriate) to facilitate vendor solution responses. 5.3 Solution Responses shall be submitted no later than 12:00 PM EDT on May 3, 2019. Response shall be submitted electronically to initiatives@nstxl.org, with “STE- RVCT” used in the subject line. Any submissions received after this time on this date may be rejected as late and not considered. traceability into the build-up of the proposed price. 5.6 Volume 1 – Technical. The technical volume shall not exceed 25 pages in length, utilizing standard 12-point font. Charts and figures are not bound by the 12-point font requirement; however, vendors shall not use this exception to “fit” a large amount of technical data in a small table or figure to stay under the page count limit. The cover page, data rights proposal/assertions, FOCI documentation, summary of sub-vendors, tables of contents, lists of figures, acronym definitions, and traceability matrices, do not count towards page count, as applicable. There is no page limit for the price volume. For offerors proposing solutions for both RVCT Air and RVCT Ground the technical volume page limit is 40 pages. 5.6.1 The cover page shall include the vendor’s name, Commercial and Government Entity (CAGE) Code (if available), address, primary point of contact, and status of U.S. ownership. □ There is at least one nontraditional defense contractor or nonprofit research institution participating to a significant extent in the project. □ All significant participants in the transaction other than the Federal Government are small businesses or nontraditional defense contractors. □ At least one third of the total cost of the project is to be provided by sources other than the Federal Government. 5.6.3 Nontraditional Defense Contractor is defined as an entity that is not currently performing and has not performed, for at least the one-year period preceding the solicitation of sources by the Department of Defense (DoD) for the procurement or transaction, any contract or subcontract for the DoD that is subject to full coverage under the cost accounting standards prescribed pursuant to 41 U.S. Code § 1502 and the regulations implementing such section. 5.6.4 Vendors shall clearly outline how the eligibility requirements of 10 U.S. C.
§ 2371b are met within their response. The onus for proof of participation to a significant extent or any cost sharing involvement lies with the submitting vendor. 5.6.5 Foreign Owned, Controlled or Influenced. In accordance with RFS Attachment 2, Security Process for Vetting Contractors, the cover page must include certification that the vendor (and subcontractor(s)) are not Foreign Owned or under USA Foreign Owned, Controlled or Influenced (FOCI) status (and are not in merger or purchasing discussions for a Foreign company or USA FOCI Company). Should a prospective vendor be unable to so certify, they will be ineligible for award unless the mitigating circumstances in Attachment 2 are met. In such a case, these mitigating circumstances shall be detailed in an appendix to the technical proposal (and will not count towards the page count). 5.7 Sub-vendors. Provide a list of all sub-vendors involved and their role within the performance of your submission as an appendix to your technical submission. The list shall include the same information as requested for 5.6.5, excluding nontraditional business status (which will not count towards the page count). 5.8 The Vendor’s focus in the Technical Volume is to describe its approach to delivering a unique prototype solution for the RVCT, as outlined in this RFS and the Statement of Need. The response should provide specific emphasis on following focus areas listed below. Vendors proposing a comprehensive solution must address all of the focus areas listed below. Vendors proposing a solution for only RVCT – Air do not need to address the focus area in paragraph 5.8.4. Vendors proposing a solution for only RVCT – Ground do not need to address the focus area in paragraph 5.8.3. • Discuss how your design supports portability and how reconfigurability is accomplished at all points of need while minimizing footprint/space. • Discuss how your architecture supports modular components with the ability to easily replace and adapt existing components for current and future technology insertions. • Discuss how the RVCT architecture will interface and integrate across multiple efforts as depicted in Figure 3 CSE and RVCT Concept and Figure 4 CSE and RVCT OTA Collaboration Concept from Statement of Need. • Describe how your architecture implements industry standards, protocols, data models, and interfaces that provide the Government the appropriate data rights to enable full control without reliance on the vendor. • Discuss your approach for reducing sustainment and lifecycle costs to best support the RVCT. • Discuss your strategy to mitigate risk associated with production throughput and supply chain management to meet IOC and FOC delivery requirements. • Discuss your approach to represent current physical and functional fidelity of unaided and aided visual systems currently utilized in fielded aircraft and ground platforms. • Discuss your approach for multiple depths of view (e.g., heads up display, virtual reality), while providing acceptable visual acuity at the near (eye point), mid (dashboard), and far (out the window) views. Presentation of the virtual environment must approximate the live environment to the fullest extent possible. • Discuss the approach to ensure head mounted displays do not cause simulation sickness. • Discuss the strategy to maintain hardware concurrency within 90 days of fielding an updated aircraft configuration. • Discuss approach for identifying proper fidelity of crew to interface with controls (i.e. Requirements Traceability Matrix for Fidelity analysis) or how your hardware approach will enable a new fidelity option without impacting positive training transfer. • Discuss your approach to ensure controls reflect the platform’s form, fit, and function fidelity (e.g., angle, force feedback, resistance, Flight Director, Digital Automatic Flight Control System). • Discuss the strategy to maintain hardware concurrency within 90 days of fielding the Abrams, Bradley, or other tactical mission software. • Discuss the approach to minimize the physical equipment layout by applying technologies that ensure the RVCT-G provides the user the feedback (e.g., form, fit, function, button, switches) necessary to select and operate controls without the user repositioning their head to view the controls (e.g., muscle memory / neuromuscular facilitation). • Discuss your approach to incorporate routine Government and external stakeholder (e.g. other OT vendors) input to enable rapid and frequent delivery of capabilities. b. Include accurate Abrams, Bradley, or other tactical mission software. • Discuss your approach that provides and shares information/data to reduce the integration and life cycle sustainment risks for all parties. • Discuss what you already have for 3D models of platform interiors and what you still need. Provide the status of current vehicles and your process to efficiently gather the information and generate the required formats. Phase 1 – Produce a prototype solution through a Critical Design Review. Phase 2 – Consists of a series of technical and user assessment events, followed by an Operational Test in 2QFY21 that is followed by and includes continued development, refinement, and support through the delivery and acceptance of the complete prototype solution at STE Initial Operational Capability by September 2021. Phase 3 – Provide Interim Contractor Support to the fielded IOC prototype location for a period of up to two years. This will allow for the collection of adequate data supporting the identification of the necessary core logistics capabilities to support the full production delivery of the RVCT and STE. excel format, as outlined above in paragraph 5.5. 5.11 Vendors must clearly state assumptions made within their response. Vendors are encouraged to challenge any Government assumptions or restrictive requirements in its individual solution and should articulate any major discrepancies between the Statement of Need and its technical solution. Should a vendor’s solution require a change in policy and/or statute, the vendor shall outline within their technical volume, and describe why the change is needed to realize the benefit of the vendor’s prototype (and potential production). 5.12 In its technical response, vendors must clearly identify if its proposed solution depends on Government Furnished Information (GFI) / Government Furnished Equipment (GFE). If so, the response must specify the GFI / GFE. If the solution is dependent on GFI / GFE, the Government will determine whether the GFI / GFE will be provided and will confirm with the vendor prior to any final solution revisions, if applicable. 5.13 Prospective vendors are advised that the following Non-Government Support Contractors may participate as advisors in the evaluation process: The MITRE Corporation, Optimal Solutions and Technology, Incorporated, and WiiKno, Incorporated. All Non-Government advisors will have signed Non-Disclosure Agreements (NDAs) with the Government. These companies have been restricted from submitting responses to any current or future STE opportunities. All support contractors performing this role are expressly prohibited from performing DoD-sponsored technical research and are bound by appropriate NDAs. All Government participants and advisors in the evaluation process will also file NDAs. 6.1 Stage 1: Individual responses will be evaluated with consideration given to the demonstrated expertise and overall technical merit of the response, feasibility of implementation, and total project risk with consideration aimed at the RFS focus areas outlined above. The proposed project price, schedule, and intellectual property rights proposal/assertions will be considered as aspects of the entire response when weighing risk and reward. The Government will evaluate the degree to which the submission provides a thorough, flexible, and sound approach in response to the Focus Areas well as the ability to fulfill the requirements in RFS Attachment 1, RVCT Statement of Need. 6.2 Stage 2: In the event that the Government finds two or more highly qualified solutions, a down-select will occur for the most qualified vendors to provide Solutions Presentations and to conduct Product Demonstrations. The Government reserves the right to request further substantiating documentation about existing capabilities in the proposed solution. The approach outlined in this section may evolve, as appropriate, to ensure the Government can most effectively determine the best solution. 6.2.1 Solutions Presentations and Product Demonstrations are anticipated to be held between May 30th and June 7th 2019 – at the vendor’s facility. Vendors selected to present and demonstrate their solution will be notified during the week prior and provided initial feedback to incorporate into their presentations/demonstrations. The Solutions Presentation will allow the vendor to further articulate its proposed solution, respond to discussion items provided prior to their Solutions Presentation, and answer further questions from the evaluation team. The demonstration phase should provide the Government the ability to see the capability proposed within your solution, as available in its current state, with the same opportunity to further articulate the solution and answer questions from the evaluation team. 6.3 The Government will award this project, via TReX, to the respondent(s) whose prototype solution is assessed to be the most advantageous to the Government, price, schedule, technical risks and other factors considered. The Government reserves the right to award to a respondent that does not meet all the requirements of the RFS. 6.4 Assessment of risks is subjective. If the risk is obvious or the schedule seems overly aggressive, the Government will consider that in the total risk assessment. Vendors are responsible for identifying risks within their submissions, as well as providing specific mitigating solutions. If sufficient validation of the proposed information is not provided, the Government may reject the submission. Operating Manual (DoD 5220.22-M) and the Department of Commerce Export Regulation (15 C.F.R. §§ 730-774). 7.2 Interaction and/or Disclosure with Foreign Country/Foreign National Personnel. The Vendor should comply with foreign disclosure processes described in US Army Regulation (AR) 380‐10, Foreign Disclosure and Contacts with Foreign Representatives; Department of Defense Directive (DoDD) 5230.11, Disclosure of Classified Military Information to Foreign Governments and International Organizations; and DoDD 5230.20, Visits and Assignments of Foreign Nationals. Upon successful completion of this prototype effort, the Government anticipates that a follow-on production effort may be awarded to the Vendor(s) for this effort, via either contract or transaction, without the use of competitive procedures if the participant(s) in this transaction successfully complete the prototype project as awarded from this document. The prototype effort will be considered successfully complete upon performance of a successful Phase 2 Operational Test. Successful completion for a specific capability may occur prior to the conclusion of the Phase 2 Operational Test to allow the Government to transition that aspect of the prototype project into production while the other aspects of the prototype project have yet to be completed. This includes requirements for sustainment purposes. A follow-on effort could involve, though is not limited to, the potential requirement for continued development and baseline management, further scaling of the solution, integration of future STE capabilities, or integration of the capability to fit within the Department of Defense’s future state of operation and training requirements. The prototype fielding quantity is estimated to be 210 or greater RVCT-A and 656 or greater RVCT-G at various locations for Full Operational Capability. To view or download the amended request for solutions (RFS) and all associated documents, click the hyperlinked text below. As a reminder, active membership in the Training and Readiness Accelerator (TReX) is required to submit solution(s) for this opportunity. Contact membership@nstxl.org if you have membership questions, issues, or concerns. If you have any questions related to this opportunity, please contact initatives@nstxl.org.